the Buddha of Infinite Light shown seated with legs crossed in padmasana and covered by long monastic robes which fall over the simple platform throne in graceful pleated folds, the face well carved with a serene benevolent expression, the ears with long lobes and the hair in traditional tight ‘snail curl’ knobs rising over the dome of the usnisa, and with a recess above the forehead formerly inlaid with the urna, carved in the round from a solid block, the back with a central square recess to receive dedicatory materials at the time of consecration, the surface showing traces of red and black pigment and remains of gilding over red lacquer. The result of Rafter Radiocarbon Laboratory test no. 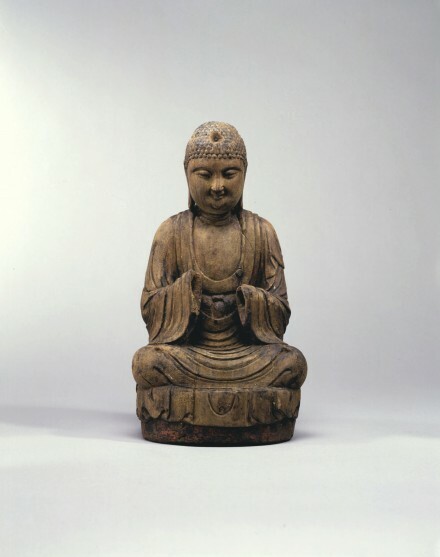 R 26539 applied to a small sample of wood from this sculpture is consistent with the dating of this sculpture; showing a 2 sigma interval reading equivalent to 1028 A.D. to 1261 A.D.